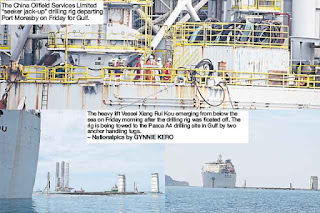 THE China Oilfield Services Limited seeker jack-up drilling rig left Port Moresby last Friday for Gulf to be used in the Twinza Oil (PNG) Limited’s Pasca gas field. The gas field is about 95 kilometres off the Gulf coast. According to Twinza, the drilling rig is capable of working in depths of up to 110 metres and capable of drilling to 9000 metres below the seabed. the rig to float off the deck of the ship. 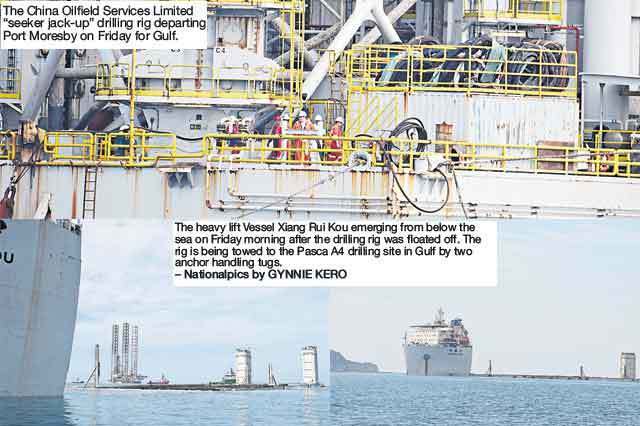 The rig was due to reach the Pasca A4 drilling site yesterday. It was towed by two tugs. The Pasca A4 well is the last appraisal well on the Pasca A gas-condensate field and will be extensively evaluated and flow-tested. Well operations are expected to continue until the end of next month. The company said prior to drilling, site-specific environment studies and social mapping studies will be done and then assessed and approved by the Conservation and Environment Protection Authority. discovered and undeveloped for nearly 50 years. the FID (final investment decision).